Scotland’s Whisky Regions – How Do They Differ? Home » Scotland’s Whisky Regions – How Do They Differ? Not surprisingly Scotland is the leading whisky-producing country in the world. Those enlightened among us who drink scotch might already be familiar with Scotland’s whisky regions, but for those who have only just found the enlightened path to a life satisfaction, below are the main whisky regions and a brief explanation of the flavour profiles. There are six whisky regions in Scotland, Speyside, Lowlands, Highlands, Islay, Campbeltown and Islands. Each region produces whisky that tastes and smells differently from the other regions. We always suggest reading a much more…shall we say…qualified opinion on the matter, which is why we offer this great book about Scotland’s Island Whisky. However, we’ve offered up the below tid bits to tide you over in the meantime. The region sits in a fertile valley of glens and rivers. Speyside is the biggest whisky producing region in Scotland with over 60 distilleries. Some of its famous brands are Glenfiddich, Glen Grant, The Macallan, The Balvenie, Glen Moray, Dalwhinnie and Glenlivet. Speyside is renowned for its sweet single malts with whiskies having flavours such as Vanilla, Apple, dried fruit, Oak, Malt and Nutmeg. The regions is famous for fruitcake, smoke and oak flirt whisky flavors. Also a major producing area, it produces a variety of whisky brands with different flavors due to its diversity. Some known highlands whiskies are Dalmore and Glenmorangie. Just above England, the area has just 5 whisky distilleries. The distilleries produce Grass, Honeysuckle, Cream, Toffee, Toast and Cinnamon flavored whiskies. Lowlands is characterized by tripled distilled whiskies such as Auchentoshan, Glenkinchie, Linlithgow, Girvan and Strathclyde. Island whiskies are pungent with peat, salinity and smoke making them complex than most whiskies from other areas. Though small it terms of size, it is the home to the world famous distilleries of Ardbeg, Laphroaig and Lagavulin. Islay is known for its single malt whiskies with flavors such as Seaweed, Brine, Carbolic Soap, Apple, Smoke and Kippers. Next time you’re pouring a hard earned nip, take the time to consider where your Whisky came from…even better, try to find it on this all time favourite whisky decanter. 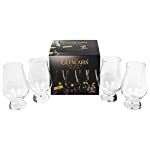 Why Are Glencairn Whiskey Glasses So Popular?